Is the tyre on the left knackered? How can I tell if it is?? Will it make any real difference if I am not as skilled as the professional drivers? These are the questions that I cannot answer, but I guess if you don't have someone around who knows the answers to these questions then experience is the only way to find out. 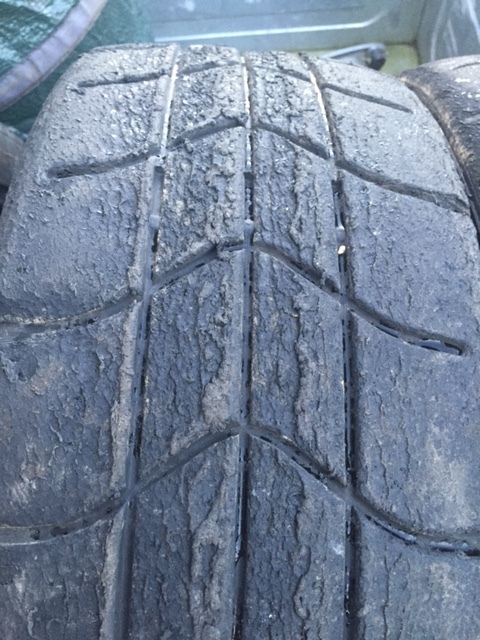 I used these tyres (which came with the car when I bought it several years ago) on the Somerset Stages in 2013 on Porlock Hill as it was the first sealed surface stage I had driven the car on. I then used them again on Porlock Hill in 2015, then lately on The Great Orme of the Cambrian Rally this year. We finished 17th fastest, so surely it must be ok?? Now you may be beginning to understand my dilemma. Tyres seem to be the 'Holy Grail' of Formula One at the moment. If you use your tyres for one lap longer than you should, forget it you are going to lose! But should the same apply to rallying? Probably. However, I am not a professional. All I know is that I can 'feel' when tyres are losing grip, but I cannot tell by looking at them if they are still worth using. Everyone you talk to (who don't have to pay for the tyres) seems to want you to put new tyres on as often as possible. When my daughter Tiffany and I competed on our first Gravel Rally together (WyeDean Rally 2013) I fitted used tyres from another competitor and left the rear tyres on for the whole rally. On the last stage, I regretted not changing them as I could feel the rear tyres sliding around lots! In an ideal world, you would change the tyres just before they begin to slide around too much. That, I guess is the art of experience?? Earlier this year when i went testing with Russell Joseph (something I have never done before) we tried different tyres. When I almost drove over the edge of a bank after changing one set (and frightening Kev Goulding to death) I know that tyres are very important but I think that I learned it is probably more important for tyres to 'feel' consistent in their grip. 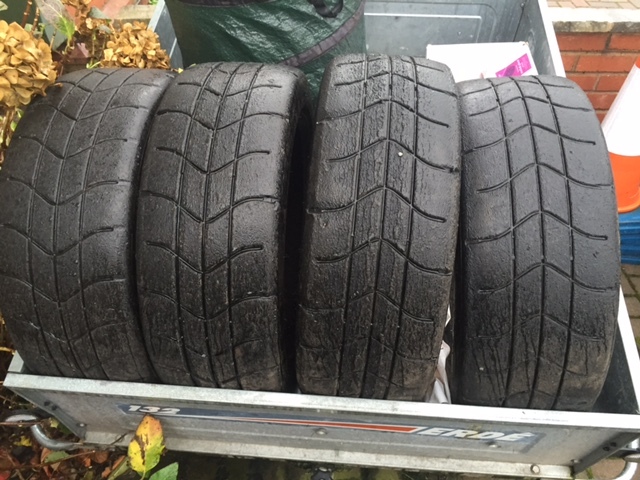 When we changed to a wider tyre, there was definitely more grip so I have also proved to myself the benefits in terms of performance and safety of the best tyres you can afford. In the future, especially with budget constraints I think that I am going to use tyres until they 'definitely' feel as if I have got the best out of them and are losing grip. Obviously I realise the risk involved in this latest theory! But then again, maybe I am just being tight!